I love museum shops. They're always full of odd trinkets that you'd never come across anywhere else: limited edition designer mugs and tea towels; fine art-inspired fridge magnets; erasers and pencils branded with famous quotes. A curious melting pot of highbrow and low. But my favourite things – without a doubt – are the postcards, of which I have a huge collection. Tempting as it is to post the funny naughty-Japanese-cat-stealing-fish one I bought at the V&A on Friday, I won't. No jewellery, no admission. But I did come across this fab (if slightly unsettling) image of a British brooch dated c. 1790-1810. 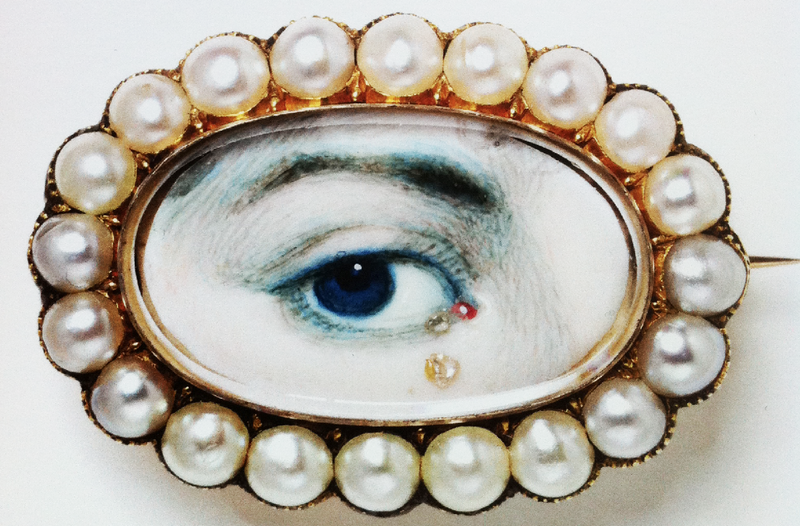 Surrounded by juicy pearls is a miniature watercolour painted on ivory with tears made out of diamonds, no less. It immediately reminded me of the 'Eye' brooches and buttons on the Bottega Veneta AW 2011 catwalk. Just goes to show, what goes around comes around, I guess.